In April of 2014, the Indiana State Board of Education approved the adoption of new standards for English/Language Arts. These new standards have been validated as college and career ready by the Indiana Commission for Higher Education, the Indiana Department of Education, and the Indiana Center for Education and Career Innovation. This means that students who successfully master these English/Language Arts objectives for what they should know and be able to do by the time they graduate from high school will be ready to go directly into the workplace or a postsecondary educational opportunity without the need of remediation. Instruction in English (literature, composition and speech) and language arts (reading, writing, speaking, listening and viewing) provides vital content for lifelong learning and problem solving in our increasingly complex technological world. English/Language Arts (ELA) instruction engages students in the essential thinking skills and processes used across subject areas. The standards provide guidance to content area teachers in grades 6-12 (e.g., History/Social Studies teachers, Science teachers, Career and Technical Education teachers, etc.) on expectations for integrating reading and writing skills into their daily instruction. 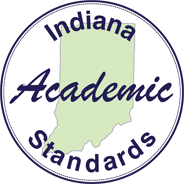 This document provides guidance and illustrates the correlations between the Indiana Academic Standards (2014) and the previous standards; Indiana Academic Standards (2006) and Indiana Common Core State Standards (2010). Teachers are encouraged to use this document as an instructional support tool.